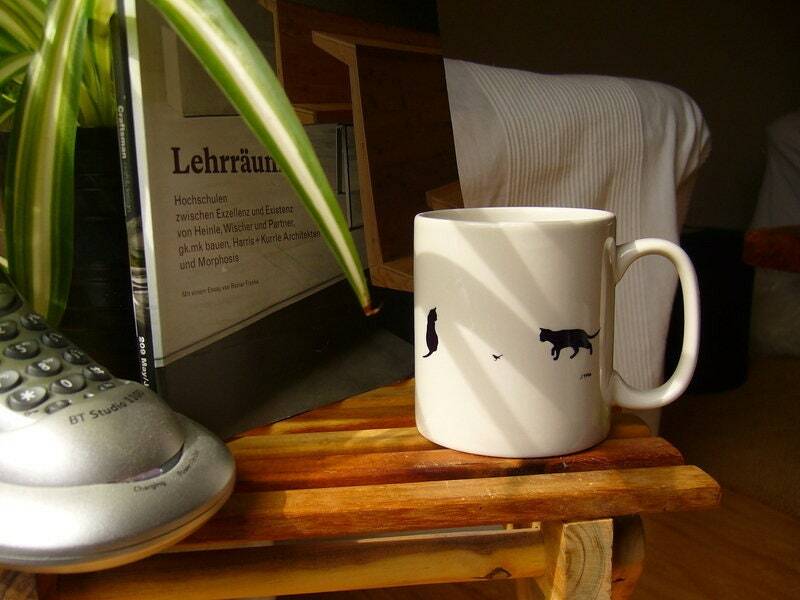 Charming Black Cats and Birds on a standard 11oz coffee or tea mug. 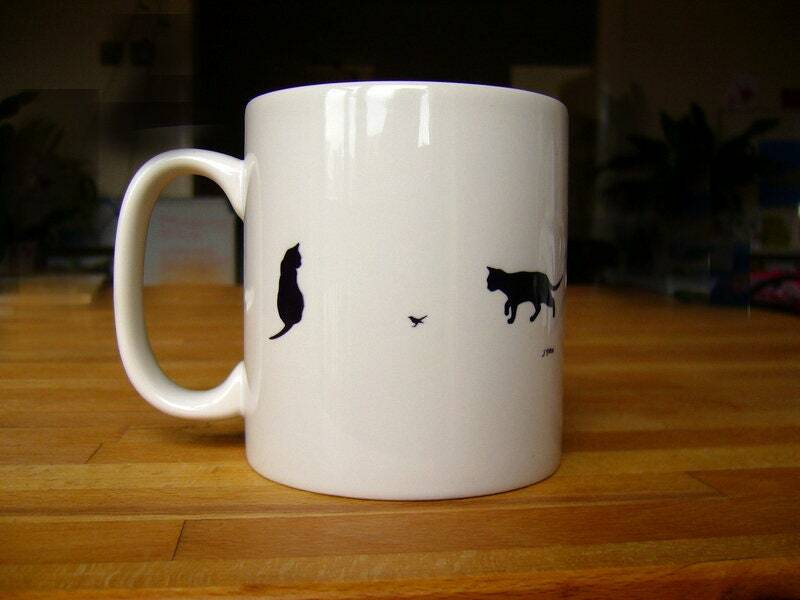 The right mug for your well deserved cuppa! This Design consists of 4 cats and two birds in total. 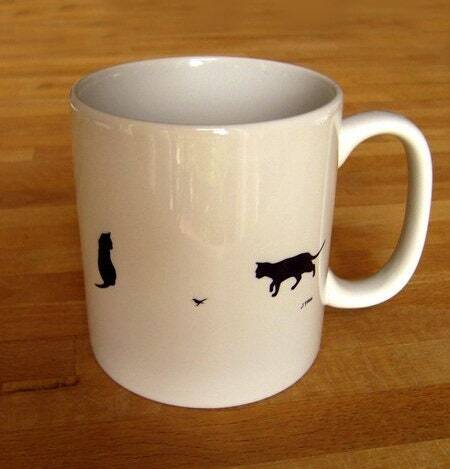 As you rotate your cup one cat is walking towards the bird while the other cat is sitting and watching. Turn the mug further you will see the same sequence again. Any form of payment is fine - but the payment must arrive before the goods are dispatched. I will endeavour to get your items to you quickly and at reasonable cost. Depending upon size, weight, destination and urgency, delivery will be assigned to an appropriate postal or courier service. If you have a special requirement, for example you are in a hurry, please contact me for a quote for expedited delivery. It will cost a little more, but may better serve your needs. If you are in other parts of the world, like Australia, Asia or South America, delivery may take between 3 and 20 working days. Please note that delivery time is separate from making time. Only once made and an item be dispatched. Please note that makers can only quote delivery times based on quotes and experiences of delivery providers used. In rare exceptions, for example around the holidays, delays though rare may ensue. If you're not happy with your purchase, please contact me on info@jolyonyates.com. I pride myself in being reasonable and fair. I'm sure that we can agree a remedy and will endevor to fulfil all reasonable requests ! Damage and losses will be addressed with replacements or refunds. Custom orders by prior agreement only. This will depend on whether it's a busy period and whether I feel I can satisfy the customer's needs. (Please note: the months leading up to Christmas are very busy and custom items are likely not possible. Likewise Summer is a time when all shop owners try to take time off, so please be patient). Wholesale is possible by prior agreement - please contact me ! As with other purchases from Jolyon, I received a beautifully packaged, elegantly designed, well-executed, high-quality item. This is my second purchase and I continue to be amazed at the quality and craftsmanship that goes into every detail, from the product to the packaging. © 2019 Studio Jolyon Yates.